A generation has traditionally been defined as the average interval of time between the birth of parents and the birth of their offspring, which makes a generation around 30 years in length. This has caused me to reflect on the events of 1984, now that a full generation has passed. Of those 30 years, it occurred to me that I’ve spent the last 20 making speeches, presentations, and facilitating workshops on 1984. Early on, we would present to a standing-room-only crowd…folks would drive from neighboring states to see the images or engage in discourse on 1984. And at camps, it was the night everyone looked forward to. Since then, crowds have slowly thinned out. While speaking at a few local universities a decade ago, I would find only the same handful of Singhs attending the event at each location. And only a few years back, an organizer and I waited around an empty room for 30 minutes, then decided to cancel. I guess you would call that “rock bottom.” I remember that night on my drive home being so frustrated at the apathy of our community, but it wasn’t until years later that it dawned on me…maybe it was me. In all those years I presented 1984, I never changed my approach. It was the same technical description of the attack and stories of bloodshed and loss. Of course, it was the personalities that inspired everyone (including myself), but even that was overshadowed by a general tone of helplessness and victimhood. Perhaps that was okay early on, psychologists would say we as a community have experienced trauma and need to emote and express our sadness and grief. Maybe this is why a quick google of “Sikh 1984” will bring you mostly images of death, blood, destruction, and fire. But I am convinced that if we want this next generation to connect with 1984…we cannot do it through sadness and loss. It will need to be a narrative of inspiration. You may ask, how can we take inspiration from such a terrible event in our history? For me, there are many. First and foremost are the personalities and their stories of courage and bravery. In the 80’s while kids my age were putting up pictures of Superman and Spiderman on their walls, I was putting up pictures of Baba Jarnail Singh, Bhai Amrik Singh, and General Shubeg Singh. Even today, these images stay in our children’s rooms besides the likes of Baba Deep Singh, Banda Singh Bahadur, and Mai Bhago. I also remember the spike in amrit sanchars at the time and the hundreds of thousands of people who showed their defiance to the oppressor and their solidarity with the Guru Granth and Guru Panth by making a formal commitment to the Guru. Each of us can probably trace a family member or friend who took amrit during that time. And If I think about the conversations with the founders and leaders of the Sikh institutions here in the US today, nearly all of them were deeply impacted by the events of 1984. This is not by accident. It’s as though these events were a catalyst for the amazing organizations that serve the panth today. But my fondest memory of that period of 1984 was going to protests and demonstration and finding myself in a sea of kesri as far as the eye could see. For that short window of time, it didn’t matter what gurdwara you went to or what jatha you were a part of…we were together. It was the closest thing I had ever seen to panthic unity. And although it was short-lived and I have barely seen it since, I take comfort in knowing that it is possible…I’ve seen it. These are the memories I have of 1984 and not only have they inspired me, they have helped connect me with my community and helped shape the relationship I have with my Guru today. This idea of taking tragic events and presenting them in an inspiring way is not my own. In fact…think for a second. When I say “Baba Deep Singh”, what is the first image that comes to mind? 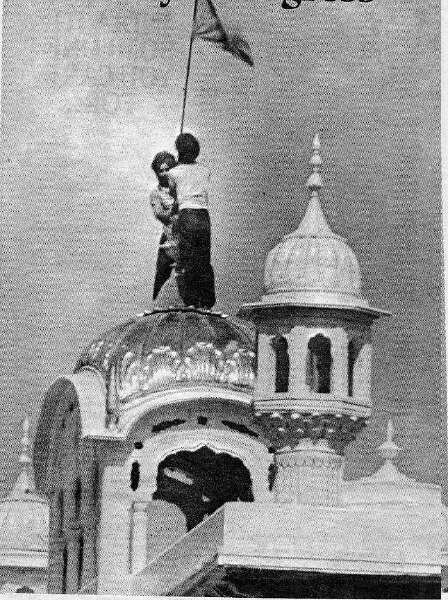 Is it the destruction of the darbar sahib shortly before his shaheedi? Or is it how the Mughal army outnumbered the Sikh soldiers? Or the thousands of Sikh lives that were lost in battle? No…it isn’t. It’s the awesome image of Baba Deep Singh wielding a sword with his head on his hand, isn’t it? And when you think of one of the most tragic stories of our history, the shaheedi of the Chotay Sahibzadae…the gruesome tale of 7 and 9 year old who were bricked alive, what image comes to your mind? The image of two little boys smiling in the face of their oppressors with their fists raised in the air, isn’t it? At a recent camp, I asked a group of children between ages 6-10 which personalities from Sikh history do they want to be like, and interestingly enough, it wasn’t Guru Nanak Sahib and it wasn’t Guru Gobind Singh…it was the Chotay Sahizbade. How could a group of children hear this painful story, yet unequivocally want to be like them? It’s because of the way we told the story. We have taken tragedy and turned them in to narratives that have inspired Sikh children and adults for hundreds of years…and we need to do the same for 1984. The movement has already begun. Organically, retreats and workshops throughout North America are drafting children’s books, creating art, drafting poems, writing songs and lullabies, all which present a positive and inspiring reflection of 1984. And initiatives like the “Connecting with 1984” small grants pool have provided a means to turn creative ideas in to tangible products. Terms such as the “Battle of Amritsar”, replacing the Government’s code name “Operation BlueStar” and phrases like “Let Them Come” are making their way in to Sikh parlance and give us a new lens in which to view 1984.